A family that resided in Königswarte, near Tachau, Bohemia, about the middle of the eighteenth century, when Jonas Hirsch Königswarter emigrated thence to Fürth, Bavaria. There he established a business that made him wealthy, enabling him to bequeath to his sons not only an honorable name, but means sufficient to insure a position in the world. At his death (1805) he left five sons, who founded banking-houses successively in Frankfort-on-the-Main, Vienna, Amsterdam, and Hamburg. Born at Fürth Aug. 10, 1807; died at Vienna Dec. 3, 1871; son of Marcus and Jeannette Königswarter, the latter being a member of the family of the imperial court agent Samson Wertheimer. Jonas received a careful and strictly religious training, and early manifested extraordinary intellectual gifts and a genius for finance. On one occasion, when his father had presented him with 20 ducats, Jonas, although but a schoolboy at the time, had the foresight to invest his little capital in bonds, which in a short time made him the possessor of 10,000 florins, a venture of which he frequently boasted in later years. In 1825 he accompanied his father to Vienna on a visit to his uncle, Moritz Königswarter, to whose daughter Josephine he soon afterward became engaged. The wedding-day had been scarcely settled when Moritz Königswarter was stricken with typhoid fever, to which he succumbed. 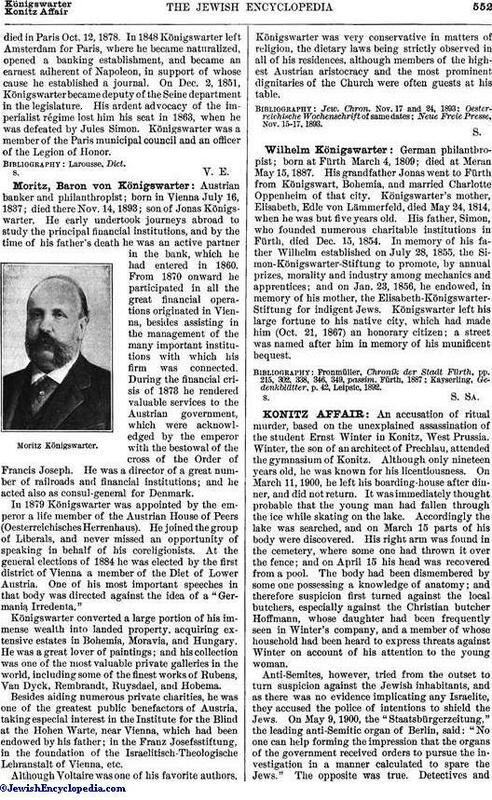 Jonas Königswarter now decided to settle in Vienna, where he became the head of the banking-house founded by his uncle, who had left no son. His business prospered; and the bank came to be ranked among the leading institutions of Austria. As a natural consequence, Königswarter was called upon to fill high public offices. In 1838 he became examiner of the Austrian National Bank, and in 1850 a director of that institution. Later he was elected to a directorship in the Oesterreichische Creditgesellschaft, the Kaiser Ferdinand's Nordbahn, the Süd-Norddeutsche Verbindungsbahn, and the Böhmische Westbahn, and he served as president of the last-named railroad for many years. He was also a member of the advisory committee of the Vienna Stock Exchange, and president of the Jewish congregation of the city. In recognition of his public services, Königswarter was decorated with the Order of the Iron Crown of the third class, and elevated to the knighthood; and in 1870 he received the decoration of the second class of the same order, and was raised to the baronetage. Königswarter, however, rated far more highly than these distinctions the warm personal esteem with which Emperor Francis Joseph regarded him. 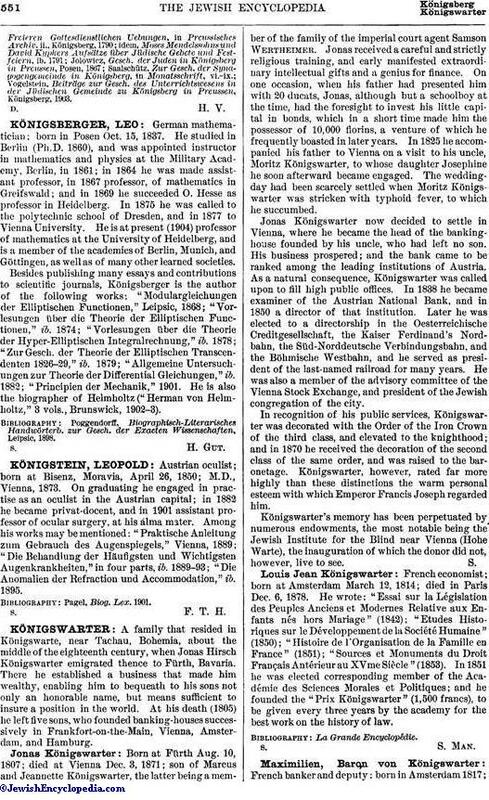 Königswarter's memory has been perpetuated by numerous endowments, the most notable being the Jewish Institute for the Blind near Vienna (Hohe Warte), the inauguration of which the donor did not, however, live to see. French economist; born at Amsterdam March 12, 1814; died in Paris Dec. 6, 1878. He wrote: "Essai sur la Législation des Peuples Anciens et Modernes Relative aux Enfants nés hors Mariage" (1842); "Etudes Historiques sur le Développement de la Société Humaine" (1850); "Histoire de l'Organisation de la Famille en France" (1851); "Sources et Monuments du Droit Français Antérieur au XVme Siècle" (1853). In 1851 he was elected corresponding member of the Académie des Sciences Morales et Politiques; and he founded the "Prix Königswarter" (1,500 francs), to be given every three years by the academy for the best work on the history of law. French banker and deputy; born in Amsterdam 1817;died in Paris Oct. 12, 1878. In 1848 Königswarter left Amsterdam for Paris, where he became naturalized, opened a banking establishment, and became an earnest adherent of Napoleon, in support of whose cause he established a journal. On Dec. 2, 1851, Königswarter became deputy of the Seine department in the legislature. His ardent advocacy of the imperialist régime lost him his seat in 1863, when he was defeated by Jules Simon. Königswarter was a member of the Paris municipal council and an officer of the Legion of Honor. Austrian banker and philanthropist; born in Vienna July 16, 1837; died there Nov. 14, 1893; son of Jonas Königswarter. He early undertook journeys abroad to study the principal financial institutions, and by the time of his father's death he was an active partner in the bank, which he had entered in 1860. From 1870 onward he participated in all the great financial operations originated in Vienna, besides assisting in the management of the many important institutions with which his firm was connected. During the financial crisis of 1873 he rendered valuable services to the Austrian government, which were acknowledged by the emperor with the bestowal of the cross of the Order of Francis Joseph. He was a director of a great number of railroads and financial institutions; and he acted also as consul-general for Denmark. In 1879 Königswarter was appointed by the emperor a life member of the Austrian House of Peers (Oesterreichisches Herrenhaus). He joined the group of Liberals, and never missed an opportunity of speaking in behalf of his coreligionists. At the general elections of 1884 he was elected by the first district of Vienna a member of the Diet of Lower Austria. One of his most important speeches in that body was directed against the idea of a "Germania Irredenta." Königswarter converted a large portion of his immense wealth into landed property, acquiring extensive estates in Bohemia, Moravia, and Hungary. He was a great lover of paintings; and his collection was one of the most valuable private galleries in the world, including some of the finest works of Rubens, Van Dyck, Rembrandt, Ruysdael, and Hobema. Besides aiding numerous private charities, he was one of the greatest public benefactors of Austria, taking especial interest in the Institute for the Blind at the Hohen Warte, near Vienna, which had been endowed by his father; in the Franz Josefsstiftung, in the foundation of the Israelitisch-Theologische Lehranstalt of Vienna, etc. Although Voltaire was one of his favorite authors, Königswarter was very conservative in matters of religion, the dietary laws being strictly observed in all of his residences, although members of the highest Austrian aristocracy and the most prominent dignitaries of the Church were often guests at his table. Neue Freie Presse, Nov. 15-17, 1893. German philanthropist; born at Fürth March 4, 1809; died at Meran May 15, 1887. His grandfather Jonas went to Fürth from Königswart, Bohemia, and married Charlotte Oppenheim of that city. Königswarter's mother, Elisabeth, Edle von Lämmerfeld, died May 24, 1814, when he was but five years old. His father, Simon, who founded numerous charitable institutions in Fürth, died Dec. 15, 1854. In memory of his father Wilhelm established on July 28, 1855, the Simon-Königswarter-Stiftung to promote, by annual prizes, morality and industry among mechanics and apprentices; and on Jan. 23, 1856, he endowed, in memory of his mother, the Elisabeth-Königswarter-Stiftung for indigent Jews. Königswarter left his large fortune to his native city, which had made him (Oct. 21, 1867) an honorary citizen; a street was named after him in memory of his munificent bequest. Kayserling, Gedenkblätter, p. 42, Leipsic, 1892.